Our thanks to John Henderson for finding this address and sending it into us. We are met to-day to testify that the immortal Bard still lives in our memory, that his fame increases with time—that his place in the world as in our hearts strengthens with the years—and that the debt we owe him is indeed unpayable. No man who ever lived has so many memorial statues in so many lands, and yet we meet to-day in Montrose to dedicate still another. We murmur to ourselves, “beyond this it is impossible for mortal to go, this must be the utmost limit,” but wait a moment, we are told that talent does what it can but genius what it must, and Burns, sweeping upward and onward under this Law startled the world by his next leap, clear out of all bounds, at which it still keeps wondering, for no mortal before or since has ever dared to entertain the idea of reformation and pardon for the Evil One. O wad ye tak a thought an’ men’. “Incensed with indignation, Saton stood Unterrified, and like a comet burned In the artic sky, and from his horrid hair Shakes pestilence and ward". Fortunately the stern doctrines literally interpreted in the Poet’s day remain with us in our day only as helpful allegories in man’s progress to higher conceptions. Not till another poet reaches this towering height upon which to-day one sits alone in solitude can the ascendency of Burns ever be questioned as the genius of the overflowing, sympathetic heart, ever alive to the sorrows of man, beast, mouse or devil. There are two stanzas which give Burns high place as a truly religious teacher of men. “The fear o’ Hell’s a hangman’s whip. In the “Cottar’s Saturday Night” we have the finest picture of humble life ever painted, inculcating the most truly religious lesson. Devotion’s every grace, except the heart! “Thine own reproach alone do fear." Having from our own conscience—the Judge within— received a verdict of approval, we have little to fear from any other tribunal. The “Judge within” sits in the supreme Court. The prophets in days past were stoned as Burns was, but the assailants of Burns in his day were wrong. He saw the great light before they did, as the prophets and leaders of mankind invariably do and must do, else they were not prophets. The day has now arrived when he, the proclaimer of the royalty of man, stands revealed to us as the true Poet-Prophet of his age. What he proclaimed has proved to be the needed gospel for the advancement of man, especially for us of the English speaking race. I have ventured to hail him as the Poet-Prophet of his age. That he was a Poet will pass unquestioned, but was he not also a Prophet; did he not see in advance of his fellows the certain growth of the rights of man through the spread of democracy, and was he not awake to the crude and repulsive theology of his day, and at the same time saw the coming of the better day in which we now live, when the God of wrath who condemned man to everlasting torment has become displaced by the Heavenly Father, who can be trusted to deal mercifully even with the sinner ? In these changes we recognise the work of Burns, it was he who laid the axe to the root of the tree of ignorance and superstition, and in doing so made mankind his debtor. Our Republic was founded upon the Rights of man—his political gospel—which permeated both Britain and America — and in more recent times has won sway over all your self-governing colonies, Canada, Australia, and New Zealand, so that to-day Burns’ political gospel rules our English speaking race, which is marching steadily, though more slowly than we could wish, to the full fruition of the ideal of our Poet-Prophet. This doctrine was such a shock to the statesmen of the day that even his editor, Professor Thorold Rogers, absorbed a full page in small type to point out how his author had stumbled. In the view of to-day the injustice lies in not taxing according to value. This just taxation the Millionaires of the Republic and Colonies have so far escaped, but their day is coming; and properly so. Let us rejoice that the old home is here in the lead, an example for her children to follow. In the “Gospel of Wealth,” published here twenty odd years ago, the graduated tax is advocated, and it is held that the modern Millionaires should receive part of the treatment proposed for Shylock, under which, according to the laws of Venice, one-half of his goods would “come to the privy coffer of the state.” So should it be with the hoards of the Millionaires of our day, and this, not as a punishment but for their own good, because it is just, and justice alone insures general contentment. On the other hand, while the Motherland leads in just graduated taxation, she is to-day following the younger branches of her race in widening her Franchise and establishing equal electoral districts, and, above all, giving each man only one vote, thus making all citizens equal. So the beneficent exchange goes on between Motherland and Childlands—the parts of the vast empire of our race ever drawing closer together, each contributing of its best to the others in fair exchange, keeping our race ever in advance in establishing the rights of man and marching steadily to perfection when one citizen’s privilege in the State becomes every citizens’ right as is the law in all the younger lands. Our race is thus rapidly becoming a veritable brotherhood which may finally be again united. The Bible in its marvellous translation, along with Shakespeare and Burns form the chief cementing bonds next to our common language and common law. Is not, art thou high or low? His riband, star, and a’ that. These few lines from Burns are ample, and constitute the best platform ever formed to guard the wise and peaceful march of progress. No violence, no physical force, all peacefully and in order. Ballots, not bullets; argument, not riot; all classes hand in hand co-operating as members of one family for the general weal of all law-abiding classes ensures the happiness of every proper class. Was loved and cradled here. One window greets the day. Wendell Holmes says “Burns should have passed years of his life in America, for these words of his, “A man’s a man for a’ that,” show that the true American feeling belonged to him as much as if he had been born on Bunker Hill.” Quite true, but born near Bannockburn is quite as effective. But why continue further in this strain? Meanwhile, let us rejoice that within the wide boundaries of our English speaking race peace is at last accomplished. The vast majority in every land, “ if Shakespeare’s tongue be spoken there and songs of Burns be in the air,” would rise in mutiny and compel their rulers to submit any difference between them to peaceful arbitration. So much for the reign of peace and the prophecy of Burns, to the fulfilment of which we are steadily marching. Burns has given the world several of these precious jewels which have already fulfilled their mission within our entire race. As far as our race is concerned, war between its parts is to-day unthinkable. In its world-wide scope it still remains a prophecy, but never can these lines fail to thrill and incite to action the hearts of men, until their mission is fully accomplished and they learn war no more—they are immortal and can die only in triumph. It is the general opinion of the world’s wisest and best that Burns stands alone. All eulogies are concentrated in two which I have kept for the close— one from the American poet, Walt Whitman ; the other from Horace Greely, the Republic’s greatest journalist, and son of a Scotch Mother. Greely declares “Of all the men who ever lived Burns nestles closest to the bosom of humanity.” Of no other man can this be said, here he has no rival. 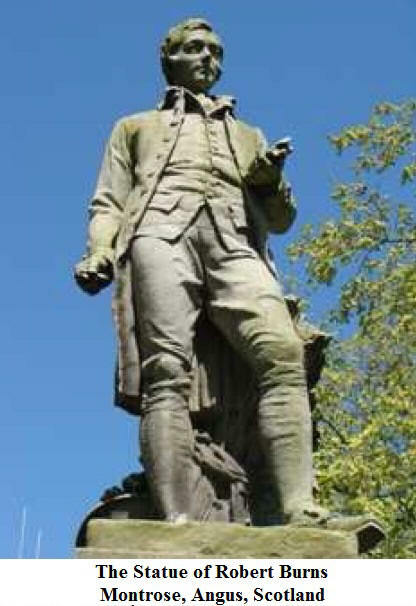 I now proceed to unveil the statue which Montrose has erected in memory of the Immortal Bard, tenderly wrapping him as it were in the folds of this last unrivalled tribute, which passes to-day unchallenged, for it is indeed true that “ Burns of all men that ever lived nestles to-day closest to the bosom of humanity. Citizens of Montrose, you honour yourselves in honouring the man who has proved himself the Poet Prophet of his age.